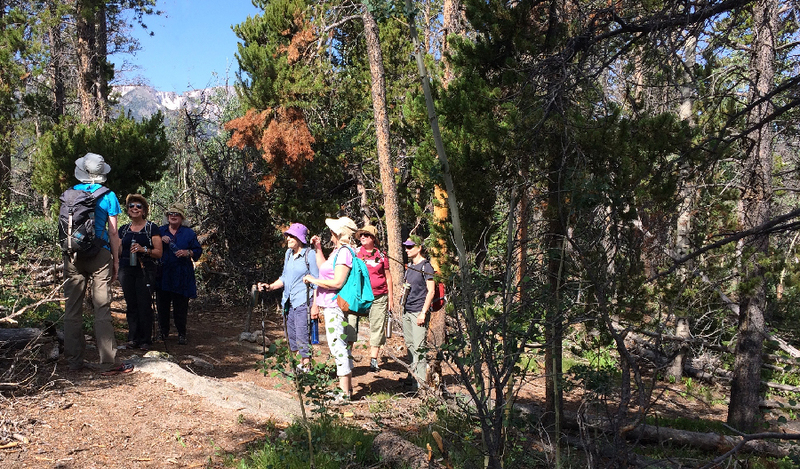 Been away at “Tapestry Camp”, a retreat with Rebecca Mezoff at Colorado State’s Mountain Campus. Can’t think of a more beautiful place to weave! 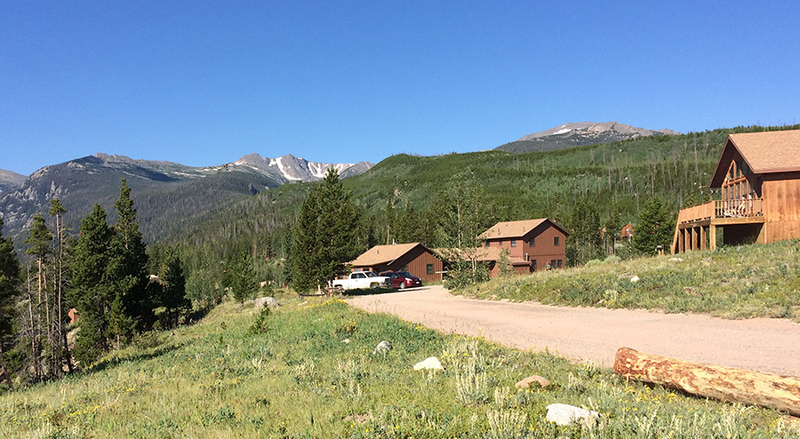 It’s about 1.5-2 hours from Fort Collins up very twisty dirt roads at roughly 9000 feet! 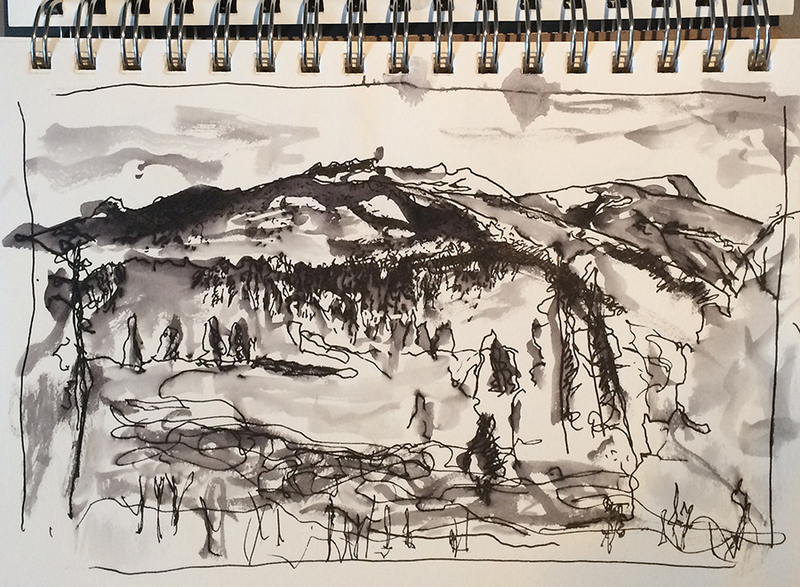 I hiked, sketched, met wonderful new friends, and wove! Bob and I flew to Denver and visited with Mary and Estes, then I left for camp and Bob stayed with them, saw a Rockie’s game, and continued his summer of trains by visiting train sites. We both had much fun. I managed to fall on my face and spent most of time in dark glasses, a story for another day, but didn’t let it stop me. The gist of our retreat was to be influenced by our surroundings and develop a weaving from our experience. Right up my alley – PROCESS! – I also wanted to work on making smoother curves etc. 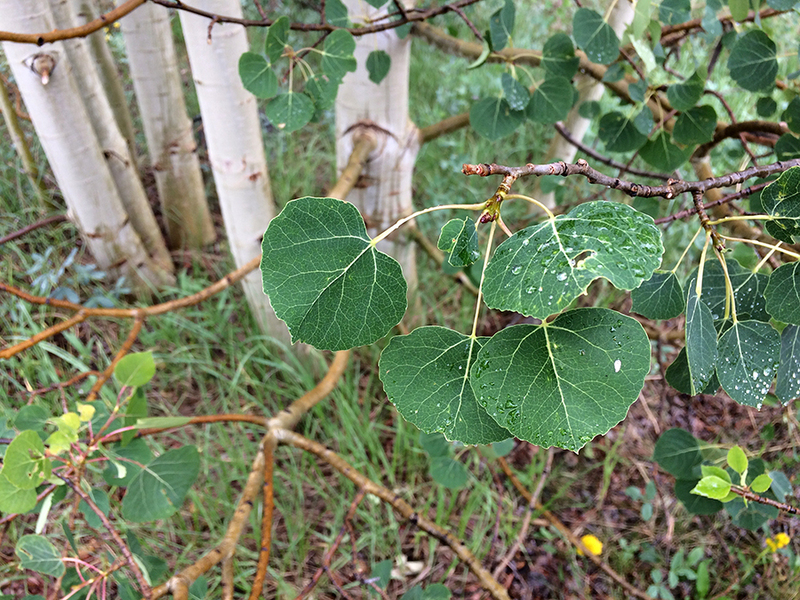 I love the aspen leaves and decided to use them – to concentrate on their rounded forms. 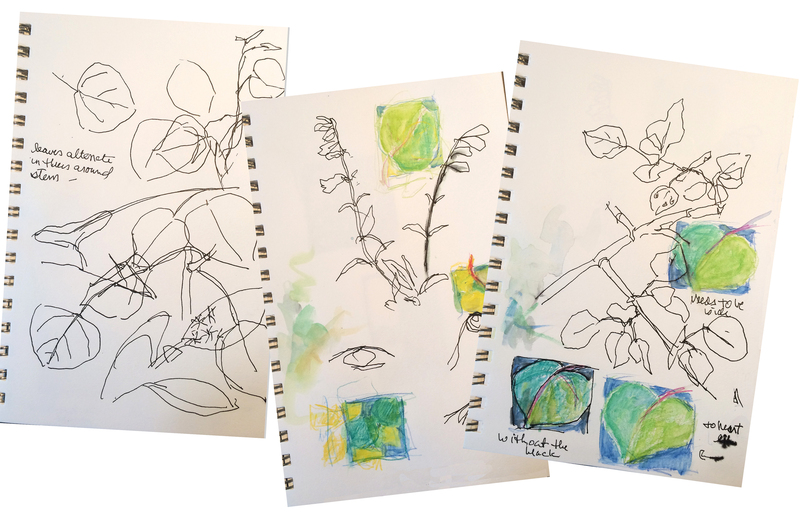 So I began by photographing and sketching, then exploring colors. Six dent Hokett looms were part of the retreat and Rebecca supplied wonderful yarns to use including these oh, so wonderful Weavers Bazaar yarns. 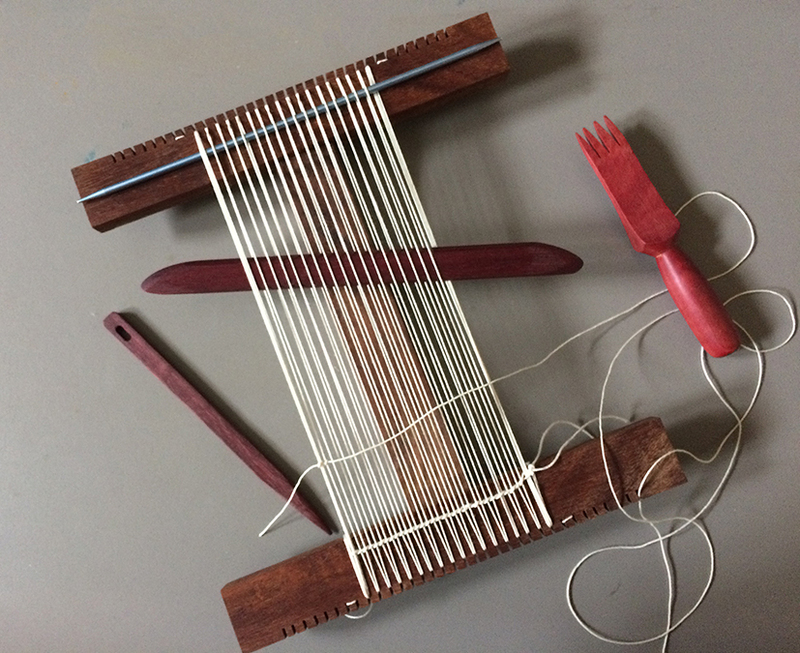 The weaving in my last blog post was done on an eight dent Hokett with much thicker yarn. Now I used the six dent loom warped double creating a twelve epi design with much finer yarns. 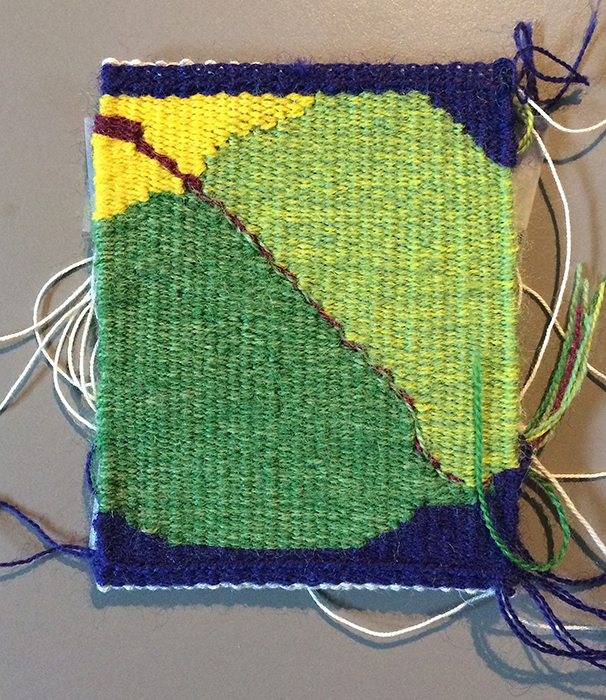 Rebecca introduced me to eccentric outline weaving which allows the curves to become smoother esp if using colors from each of the adjoining blocks of color. 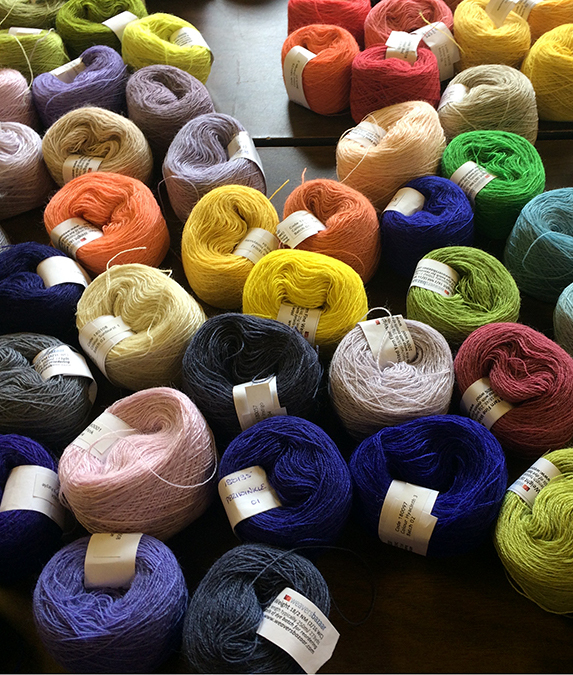 That and the 12 epi with finer yarns did the trick. Off the loom – still needs finishing.